Ruth Slenczynska – A profile of her life. Ruth Slenczynska was born in 1925 in California. She started learning piano from her Polish father, a violinist, when she was three years old. At the age of four, she had already started to give piano recitals. She went to the Curtis Institute of Music at age five (her classmates included Shura Cherkassky, Jorge Bolet and Samuel Barber, who were all much older than her) and made her debut in Berlin and New York at age six and eight respectively. At the age of nine, she went on stage instead of Rachmaninov who fell suddenly ill, and won a great success. New York Times praised her as “the first child prodigy since Mozart;” Rachmaninov also called her “the most gifted person I had ever known.” However, she gradually became resistant to her father’s Spartan education and started to reject to go to stage by the age of fourteen. She left home when she was nineteen and studied Psychology in the university. At the age of twenty-six, the great conductor Arthur Fieldler invited Slenczynska to come back to the stage. She was soon accepted with enthusiasm by the best orchestras around the world, cooperating with famous conductors such as: Pierre Monteux, Leonard Slatkin, and Seiji Ozawa. When she got to her sixties, she had already given more than 3,500 concerts around the world, and released 12 gold disks from American Decca during the LP period. In 1960’s, at the peak of her career, she suddenly decided to stop almost all the commercial performances, dedicating herself to musical education in South Illinois University, educating many excellent pianists. She remained a concert pianists until the age of eighty and kept attracting numerous fans with her perfect techniques and soul-moving music. Her life was introduced by several TV programs, as well as Reader’s Digest and Life. 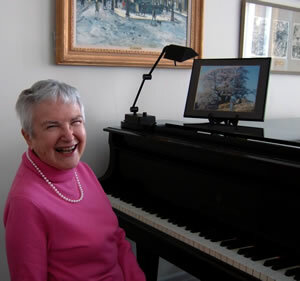 She published two long-selling books: “Forbidden Childhood” and “Music at Your Fingertips,” contributed regularly to music journals including Clavier, Piano Quarterly and Music Journal, and was a longtime columnist for Key board. She has also been invited as judge in the American Chopin Competition, Liszt Piano Competition, Busoni International Competition and International Piano Competition in Taiwan. April 2003, at the age of seventy-eight, she came to Japan for the first time, and gave her first recital in Japan in Liu Mifune Art Ensemble in Okayama. 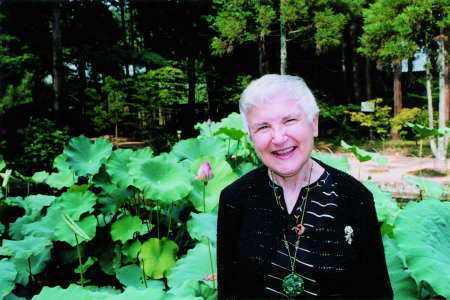 Later she gave 6 more recitals in Okayama in November 2003, July 2004, January 2005 (the last concert celebrating her 80th birthday) and April and November 2007. Until 2005, a total of 8 live CDs (“The Art of Ruth Slenczynska ” (I~IV) )were released, receiving favorable reviews. NHK’s documentary “The Last Concert” recorded Slenczynska’s last concert in full detail. In April 2007, her piano recital dedicated to the Daigo cherry tree was filmed in OHK’s documentary ” When the 1000-year-old cherry tree met the piano.” Both documentaries caused national sensation in Japan. Slenczynska retired from performing in 2005. However, even at the age of 83 now, she still keeps on practicing, reaching even higher plane of pianism. Copyright (C) 2005-2018 Liu Mifune Art Ensemble.All Rights Reserved.